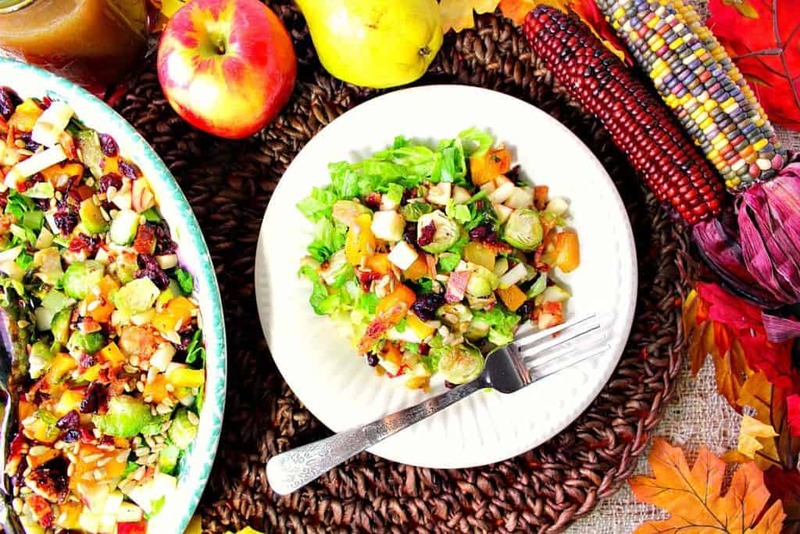 This Chopped Fall Fruit & Vegetable Salad has all the colors and flavors of autumn and can easily grace any table, for any occasion. I made this salad to bring to a dinner party a couple of weeks ago, and it was such a hit that I was asked to blog about the recipe as soon as possible! **Please Note – The printable recipe card with detailed instructions, complete ingredient measurements, and nutritional information for making Chopped Fall Fruit & Vegetable Salad is available near the end of this post. Eating with your eyes is almost as important as pleasing your taste buds. 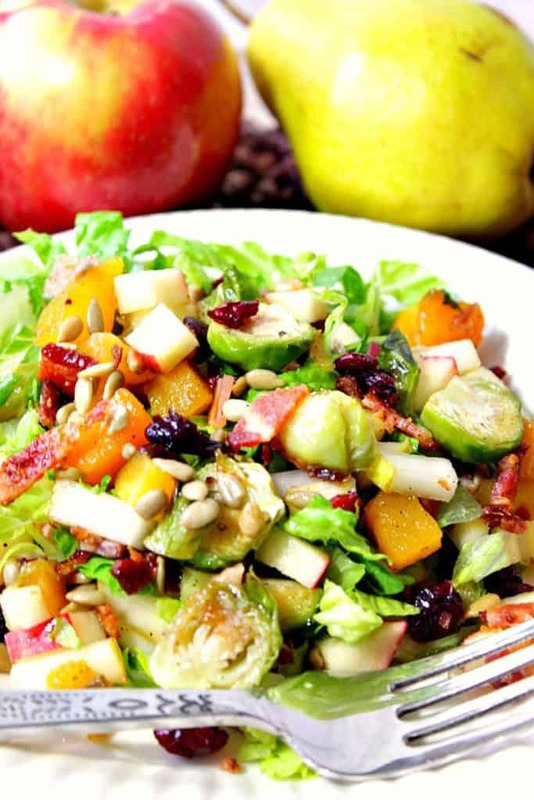 Today’sChopped Fall Fruit & Vegetable Salad will delight both those senses. 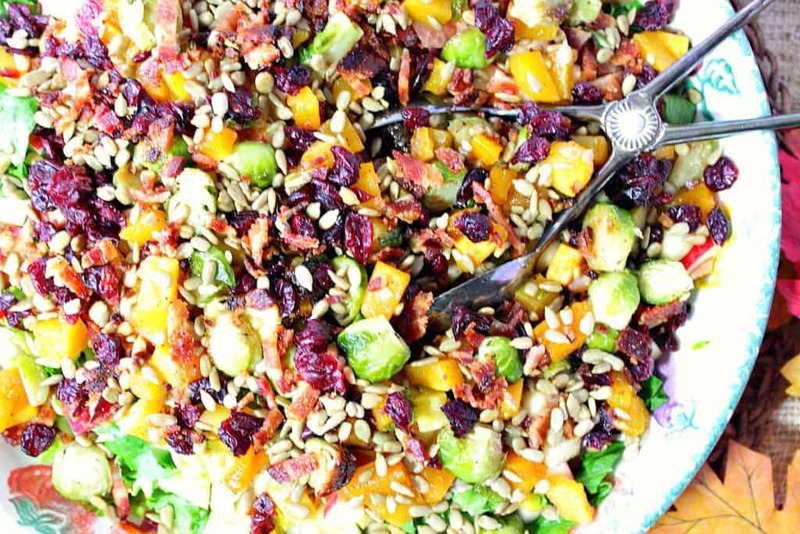 With the wonderful jewel tone colors of roasted butternut squash and Brussels sprouts combined with dried cranberries and bacon, this salad a feast for the eyes and one that will be a welcome addition to the Thanksgiving table because it’s crazy delicious! I LOVE roasting butternut squash and Brussels sprouts in the fall. I also love the when autumn’s apples and pears are at their freshest and most flavorful. 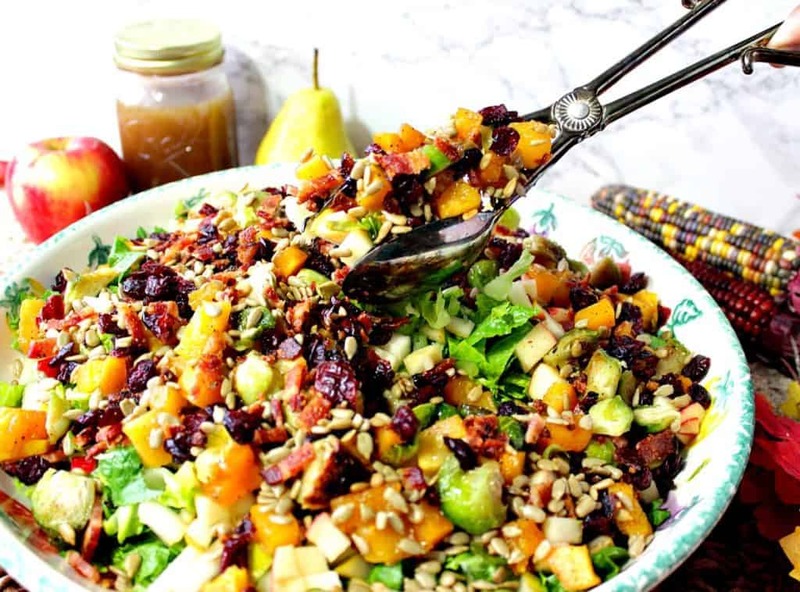 Naturally, since this is a Chopped Fall Fruit & Vegetable Salad, I used all of those ingredients in this salad along with some dried cranberries, sunflower seeds, crunchy romaine lettuce, and (for my husband) plenty of BACON!! Since this recipe calls for roasting the butternut squash and Brussels sprouts it takes a wee bit of advance preparation so when it’s time to make the salad all the ingredients are chilled and at the same temperature. I recommend roasting the vegetables and cooking the bacon up to 2 days in advance and keeping them in the refrigerator until you’re ready to assemble the salad. This advanced preparation will be a blessing on a busy day when you’re trying to put a big meal (like Thanksgiving) on the dinner table. To complement the fall theme of this salad, I made a quick fall vinaigrette to drizzle over the top which really added to the flavor of this scrumptious salad. However, this salad would be perfectly delicious with whatever type of dressing is your favorite. A chunky Blue cheese, in particular, comes to mind. I’ll leave a few Amazon affiliate links for the pumpkin vinegar and walnut oil down below if you’re interested in purchasing it. Add the walnut oil, pumpkin vinegar, Dijon mustard, minced garlic, salt and pepper in a jar with a tight-fitting lid. Shake well to emulsify and refrigerate until ready to use. Shake again before adding to the salad. *Note – this dressing would also work as a marinade for seafood and chicken. **By clicking on the Amazon affiliate photos below, you’ll be taken directly to Amazon.com to purchase these items, if desired. As always, you are under no obligation to do so. 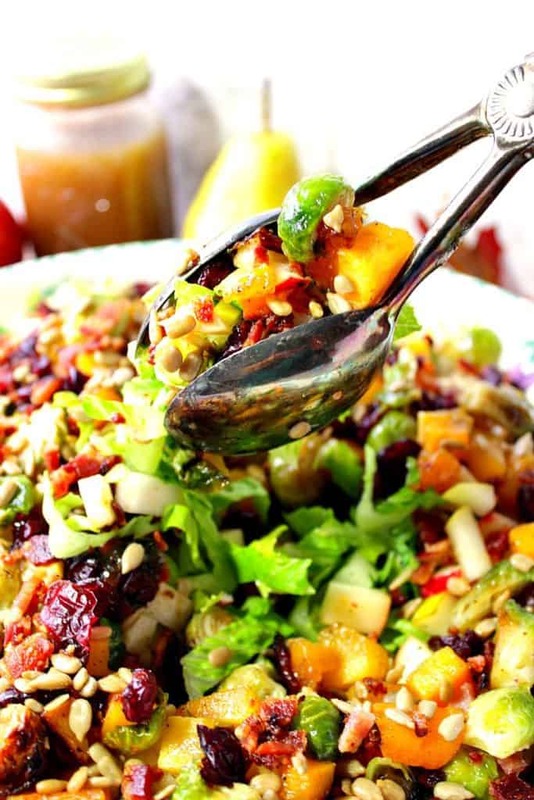 Now that the dressing is made, let’s assemble the Chopped Fall Fruit & Vegetable Salad. You can prepare the roasted butternut squash and Brussels sprouts in advance by placing the chopped squash and cleaned and quartered Brussels sprouts in a large bowl. Toss them with olive oil and maple syrup. Season them with salt, pepper, and freshly grated nutmeg. Place the prepared vegetables on a baking sheet and roast them in a preheated 425-degree oven for 20 minutes. Remove the vegetables and allow to cool. Lay the bacon strips on a separate baking sheet and cook in the oven until crisp, watching carefully so it does not burn (approximately 20 minutes). Once the bacon is cooked, drain on paper towels and cool. The roasted vegetables and bacon can be made up to two days in advance and stored in the refrigerator until you’re ready to assemble the salad. Up to 1 hour before serving, chop the bacon and romaine lettuce. Place the chopped romaine in the bottom of a large salad bowl. Chop two pears, and one apple. 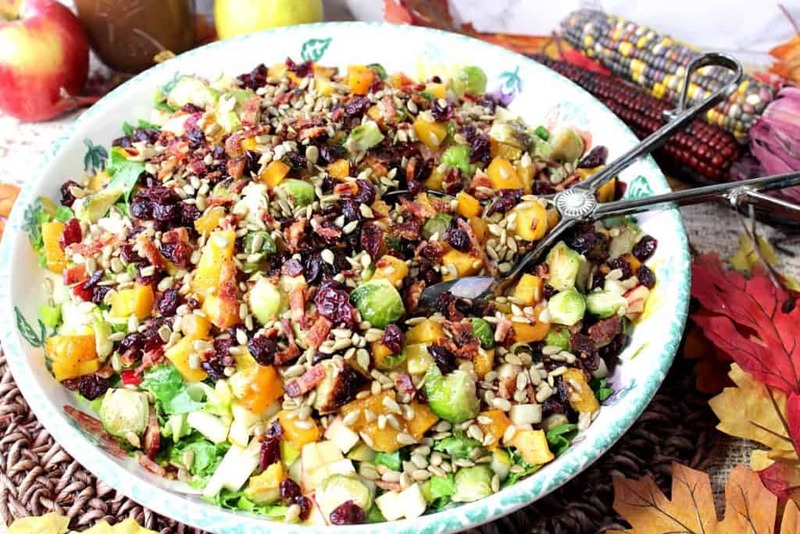 Assemble the salad by layering the remaining ingredients, including the cooled, roasted butternut squash and brussels sprouts, dried cranberries, bacon, and sunflower seeds. Drizzle the salad lightly with the prepared pumpkin vinaigrette before serving, if desired, or allow each person to add their own dressing when ready to eat. This salad will keep, well covered in the refrigerator for 1-2 days, without dressing. Since I LOVE cooking with butternut squash and Brussels sprouts (sometimes together and sometimes separately), below, you’ll find some of my all-time favorite recipes which utilize these seasonally delicious autumn ingredients. By clicking on the recipe titles, you’ll be taken directly to that particular recipe. Each and everyone would be a flavorful and colorful addition to your Thanksgiving table. Below is the printable recipe card for today’s Healthier Blueberry Peach Pancakes. If you’ve enjoyed this recipe and look forward to making it (or have already made it), I’d appreciate if you’d take a moment to give it some feedback by way of stars near the comment section at the end of this post. Thank you so much! 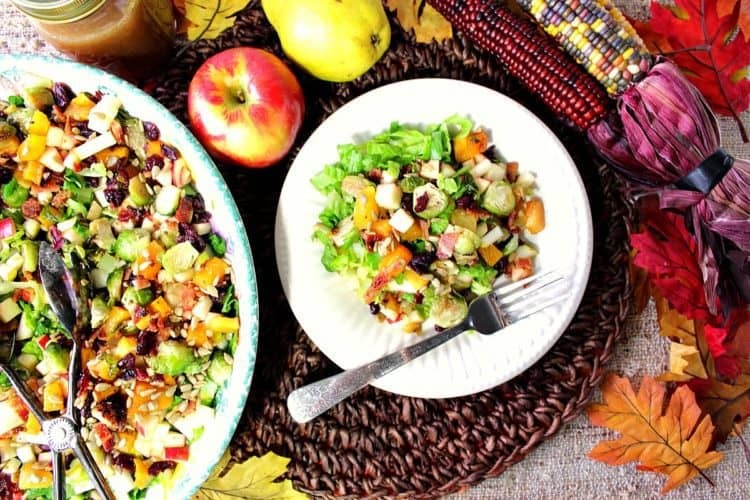 This Autumn Harvest Chopped Fruit & Vegetable Salad has all the colors and flavors of fall, and can easily grace the Thanksgiving table. Toss the butternut squash and Brussels sprouts in a large bowl with olive oil, pure maple syrup, salt, pepper, and nutmeg. Cook and crumble the bacon. Refrigerate if making in advance. 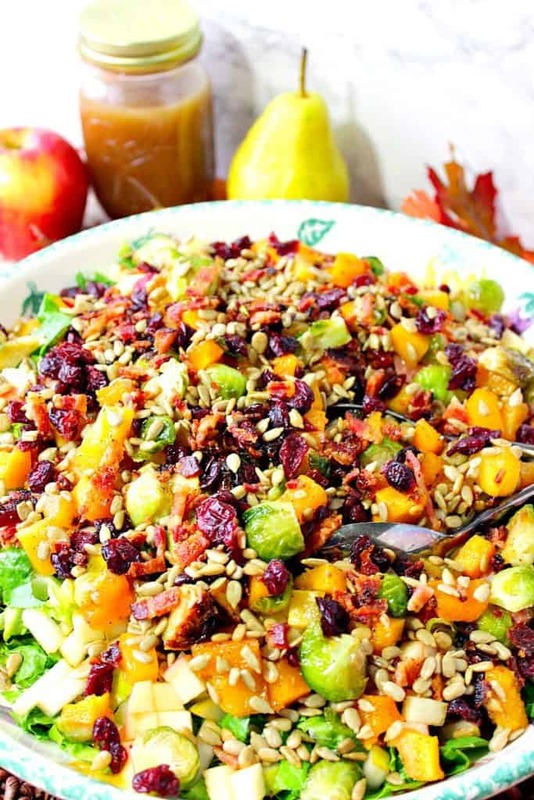 Layer the chopped romaine lettuce, cooked and cooled butternut squash and Brussels sprouts, chopped apples and pears, dried cranberries, bacon, and sunflower seeds. Add all ingredients into a jar or container with a tight-fitting lid. Shake. Lightly drizzle the dressing onto the salad and toss before serving. Serve with additional dressing on the side if desired. This dressing may also be used as a marinade for chicken or fish. 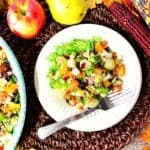 I hope you’ve enjoyed this recipe for Chopped Fall Fruit & Vegetable Salad as much as I’ve enjoyed bringing it to you. Should you have any questions regarding this recipe or anything else you see on my site, please don’t hesitate to contact me directly or leave me a comment in the comment section below. I will always reply to your questions as quickly as possible. I would have never mixed fruits and vegetables in a single dish, Renée! However, after seeing your recipe, I will have to give it a try. Can I use agave syrup instead of maple syrup? It would definitely work as a sweetener. I used the maple syrup to mimic the fall flavors I was using in the salad, but I’m sure the agave would work. Or, you could leave it out altogether. I know you will love this salad, Agness. It’s delicious and healthy. I love all of the autumn veggies in this! I have been obsessing over Brussels sprouts and butternut squash lately, so I’m really excited to try this. Thank you! You’re going to absolutely love it. It’s always a hit whenever it’s served. Enjoy, and thanks!!! I love everything in this! It’s so good! Thank you. Glad you think so, too!